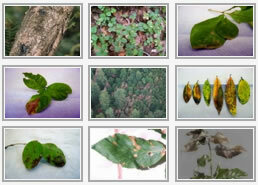 In this section, you’ll find links to descriptions and photos of Phytophthora ramorum symptoms, a list of currently known host plants, and how to diagnose, treat, and manage the disease. Hosts and Symptoms: Information on how Sudden Oak Death affects host plants and how to get an accurate diagnosis. Best Management Practices: Customized BMPs for different user groups, in printable PDF form. Treatment and Management: Information on the many facets of managing this forest disease, including treatments and options for restoration. Sanitation and Reducing Spread: Helpful details and links on sanitation measures to reduce the risk of spreading the pathogen. Regulations: Information on federal, state, and international regulations on P. ramorum. Response Planning: Sample invasive response plans and other resources for advanced preparation. P. ramorum in the Urban Interface: List of resources for those who live and work in infested areas along the urban-wildland interface. P. ramorum in Wildlands: Resources useful when addressing or managing P. ramorum or Sudden Oak Death in forests and wildlands. P. ramorum in Nurseries: Information for nursery growers and regulators working in nursery environments. P. ramorum in Oregon: The Oregon Sudden Oak Death Task Force’s Strategic Plan for managing P. ramorum in Oregon’s forests. Also the OSU publication Sudden Oak Death: Prevention, Recognition, Restoration. Tribal Resources: Information about Sudden Oak Death (Phytophthora ramorum) and native plants with an emphasis on those issues concerning tribes.